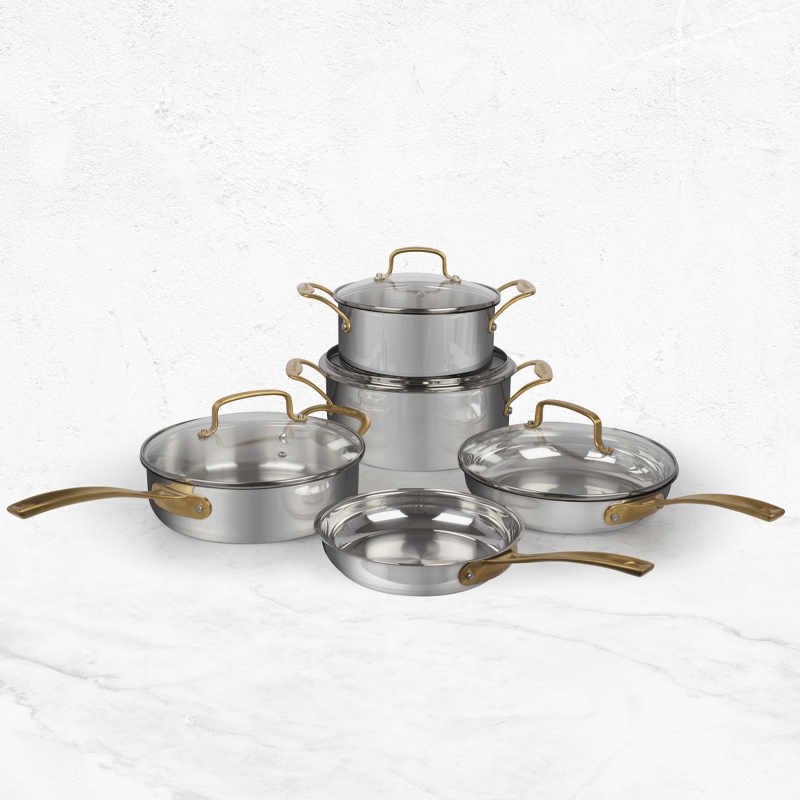 This premium cookware set is constructed with a layer of pure aluminum embedded into gleaming, mirror-finish stainless steel. Home chefs will love the quick heat-up and even heat distribution as well as covers that fit tightly to lock in flavor and texture. Cast gold stainless handles are professionally riveted and contoured for a secure grip which add exceptional style to any kitchen. 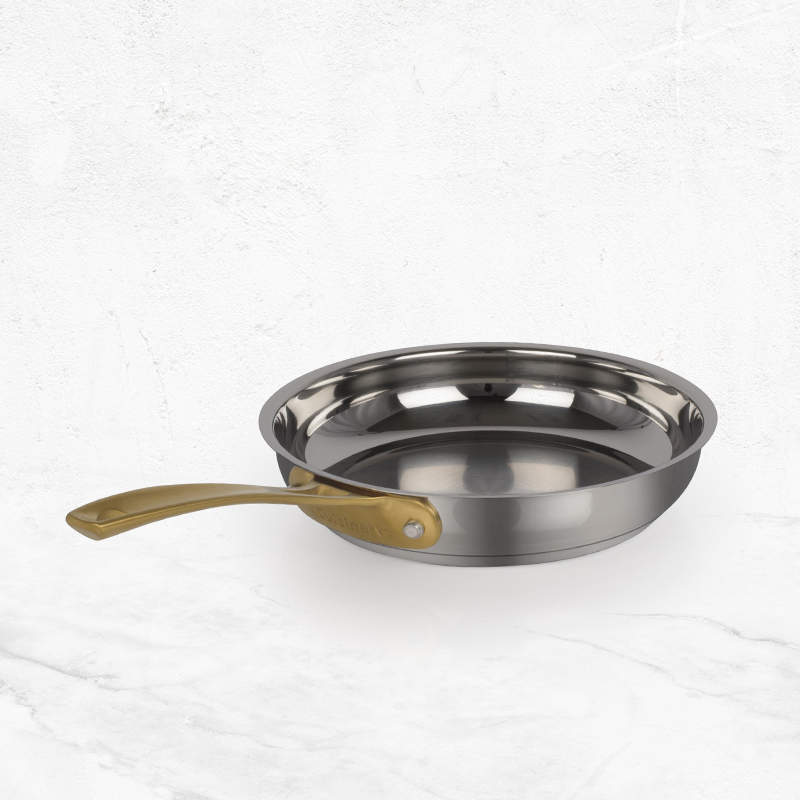 The set is designed to cook on any stovetop, induction ready, and oven-safe to 500°F(260°C) Glass Lids 350°F (176°C). Professional Stainless Steel Construction - Premium stainless steel offers optimal cooking performance. Unsurpassed Heat Distribution - Aluminum encapsulated base heats quickly and spreads heat evenly. Eliminates hot spots. Versatile Performance - Goes from stovetop to oven – safe to 500°F (260°C) glass lids are oven safe up to 350°F (176°C). The Coolest Touch in Home Cooking - Cast stainless steel cool griptm stick handles are contoured for a secure grip and designed to stay cool on the stovetop. Tempered Glass Covers - Sleek, tempered glass lids allow easy monitoring of food during cooking and complete the classic design. 23.50" x 14.50" x 10.00"